Happy Monday everyone! I have got an interesting post today, something that is way, way out of my comfort zone. Now first off let me start by telling you guys that I have no tattoos at all, and when this company reached out to me and asked if they can send me this product, I was about to tell them that I doubt that I am the correct person to test this. But different strokes for different folks right? I rather saw it as a challenge to see what else I could use it for and make this post interesting. Tattoo addict says : "Creating a smooth breathable layer to help with healing. Our product is created with no colorants or antiseptics to minimize irritation even to the most delicate skin. Originally developed to create a smooth breathable layer to help heal tattoos, many people are discovering that it's natural properties and texture is great for a wide range of alternate application. With beeswax for moisturizing, shea butter for cell regeneration and essential oils which act as anti-oxidants anti-bacterial, anti-fungal and anti-inflammatory agents". The ones in bold is the ones I used this balm for and yes, it helped for most of the above mentioned. But I will get to that in a while. Packaging - This product comes in a standard tube form with a twist off cap. When you first open the cap there is a protective layer of foil over the opening and it's stuck there quite well. I struggled to get it open, hence the fact that it looks a bit haggard. The tube is relatively thin and can be stored standing up, or it can be stored in a drawer laying down. I found no hassles with the packaging. Consistency - It is a very runny consistency, almost like a thin oil. 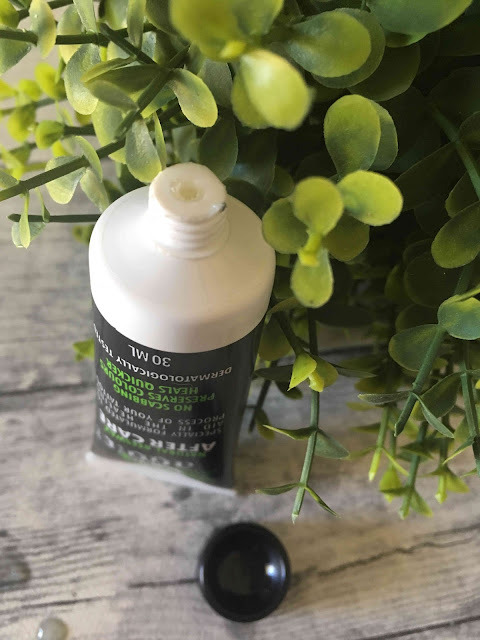 At first when you apply this product it will feel very oily, but will soon be absorbed into your skin leaving it feeling moisturized and soft. You do have to work quickly with it, but it is easy to spread and I have found that a tiny bit goes a long way. Application - I have also found that because the consistency is so runny, you have to work fast, like I mentioned in the topic point above. I do believe that this runny consistency add to the effectiveness of this product. It gets absorbed by the skin extremely fast which means less rubbing to that delicate tattoo'ed skin. When using as a lip balm, I found that you only need the most tiniest bit and it will do the trick because of the light weight feel. Smell - Now as Tattoo Addict has mentioned there, is no anti-septic in this product witch means your skin is less likely to get irritated, but this lotion (for lack of a better word) is filled with loads of essential oils that make it smell herbaly (not sure if there is a word like that) and that will keep your tattoo from infection but also moisturized. Benefits - It's said that when you use this aftercare product your tattoo will have no scabbing or is less prone to create scabs. It also preserve the color of your tattoo and will also speed up the recovery process. Where to find this - You can visit the Tattoo Addict website and order directly from them, but they also have suppliers that stock their products all over South Africa, check out this link to find a studio close to you. They are even sold in Namibia and Botswana. Pricing - This treatment will set you back R114 for 30 ml. Being able to use this for a multitude of functions, the price point is amazing. Now because I do not have any tattoo's to test this on, I challenged myself to find some creative ways to use this product. Lip Balm was my first test. (soooo creative, I know!) But what was interesting is that it worked better on healing my cracked and chapped lips than to keep them healthy. I then went through most of the uses listed and the ones in Bold was the ones that I found it made a diffidence in. In the end when there was just a tiny bit left in the tube I thought I have to go out with a bang! So this is my PRO BEAUTY TIP : Use a tiny dot of the Tattoo Addict After Care where you usually would spray your perfume, wait a few seconds for the smell to disappear and then spray your perfume as normal. As this product sinks into your skin, it takes the perfume with it and makes it last longer. Thank you so much for the team at Tattoo Addict for sending me this product to test. Let me know if there is any thing you want to know or feel free to contact them.